Choosing the flooring is one of the biggest decisions you’ll ever make when it comes to bathroom remodeling. There are so many different options to choose from that it can be difficult deciding which one to use. You want something that matches your overall décor and theme but you can’t choose bathroom flooring based solely on color or the type of design it has. When choosing flooring for the bathroom, you have to make sure it’s well suited for this type of environment and the following information can help. While things like color and patterns help to bring the look of the room together, the type of materials used to make the flooring is a major factor that will determine which one to use. You’ll want to avoid any type of porous flooring material due to its ability to absorb moisture. Over time, this type of flooring will begin to look stained and dirty and the only way to fix it is by replacing it. Wood flooring is not recommended for bathrooms either because the water will make the wood swell and crack. When you get out of the tub or shower, you don’t want to be slipping and sliding around the room but if you’re not careful, you may end up with tile that gets very slippery when damp. This can be dangerous and result in many accidents. Even if you put down bathroom floor mats to protect you when you get out of the tub, they can slip and slid around on certain types of flooring, too. Therefore, you need to look for tiles that are water resistant and that have anti-slip surfaces. Matte finishes and textured patterns are good options for bathrooms. Small tiles can also help to prevent accidents because they use more grout, which breaks up the slick areas. Putting down new flooring may seem like an easy enough job but its more to it than it looks like. Depending on what type of tile you choose, you’ll need to match up the pattern and keep the tile all the same height and distance apart. You’ll also need to cut the tile around the commode, shower and corners of the room. Mixing the mortar and keeping the tiles straight is a big job that would be difficult for someone with no experience to do. If you try to do the job yourself and mess up, someone will have to chip up the tiles and start the job over. This will end up costing you a lot more in funds and time due to the extra work involved. A professional will also know if the original floor is in good shape or if you need to replace it before putting down new flooring. If the home ever had any type of water damage, this could be a big issue. Choosing the right flooring for your bathroom can be a difficult task. It has to be something that can get wet repeatedly without sustaining damage and it needs to have a slip resistant surface to help keep you and your family safer. 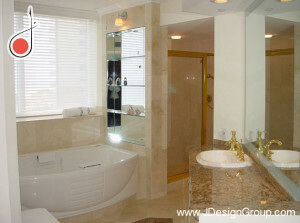 For this reason, it’s best to leave bathroom remodeling to the interior designers and other professionals. You never know what type of problems you’ll run into once you get started.